Match referee says security forces vanished, left officials to be "sitting ducks"
(CNN) -- Pakistani authorities released photos of two suspects Wednesday as they continued to hunt for the gunmen responsible for an attack on the Sri Lankan cricket team which left seven people dead. 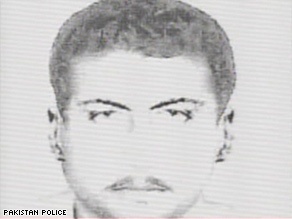 A Pakistan police sketch of one of the suspects. Six police officers and a driver died in the attack. Investigators cannot yet say who was responsible but security camera footage was released showing the attackers fleeing. The video apparently shows small groups of attackers -- up to three per group -- jogging up a street apparently carrying weapons and using motorbikes to escape. Sri Lanka's cricketers returned home to Colombo early Wednesday. Sri Lankan vice-captain Kumar Sangakkara told CNN that Paranavitana and Samaraweera were due to undergo surgery later Wednesday. He said Samaraweera still had a bullet in his leg. Describing the attack in an interview with CNN, Sangakkara said he had feared Paranavitana had been fatally shot. But match referee Chris Broad spoke critically Wednesday of the conduct of the Pakistani security forces during the attack, claiming a van detailed to protect the convoy had vanished. "I am angry at the Pakistani security forces," Broad told a press conference on his return to Manchester. "We were promised high level security and in our hour of need that security vanished and they left us to be sitting ducks." Pakistan's President Asif Ali Zardari has praised the police killed in the attack, saying the officers "rose to the occasion and laid down their lives to protect our Sri Lankan guests." Blog: Who carried out attack? Teams have long stayed away from Pakistan, concerned about the security situation in a country that is battling an escalating pro-Taliban insurgency. Sangakkara said sporting organizations would have to not rethink security worldwide for all sports. "I think this will probably be, though hopefully not, the start of a very scary time for international sportsmen," he said. "If it starts in the subcontinent with cricket it's hard to imagine it stopping there." International Cricket Council President David Morgan said Tuesday that the attack in Lahore had been shocking. Sri Lanka -- a country enduring its own civil war with separatist rebels -- agreed in December to visit for a series of matches, after the Indian cricket team called off its tour following the deadly terror attacks in Mumbai in November. Indian authorities blamed those attacks on Pakistan-based militants. Along with with India, Sri Lanka and Bangladesh, Pakistan had been due to stage matches in the Cricket World Cup in 2011 but cricket authorities have admitted the prospect of Pakistan playing any hosting role in that tournament now appears unlikely. Ehsan Mani, a Pakistani cricket official who was president of the ICC from 2003 to 2006, said it would be years before international cricket would be played in Pakistan again and the said plans for the entire 2011 World Cup were in doubt because of recent violence in all four countries of the Indian subcontinent. "I would be surprised if it does take place there (in Pakistan), but I've got a bigger concern," Mani told CNN. "I think the whole of the subcontinent is going to be under pressure."